Ha. Poor guy. I usually only make things with things that we like so I figure that it will never be too bad. But he doesn’t have that kind of faith so sometimes when I tell him what we are eating he just braces himself . . . I guess. So when it turns out good he is surprised. In order for the bread crumbs not to burn I didn’t cook the beets as long as I would have, so they ended up crunchy and slightly under cooked . . . but cooked fine. Perhaps not so much “under cooked” as not-as-cooked-as-I-normally-would-have-cooked-them. So we had golden beets. They came in our produce box. And they were tiny. Two of them were about the size of a golf ball and one was a little bigger. Cover your baking sheets with aluminum foil. 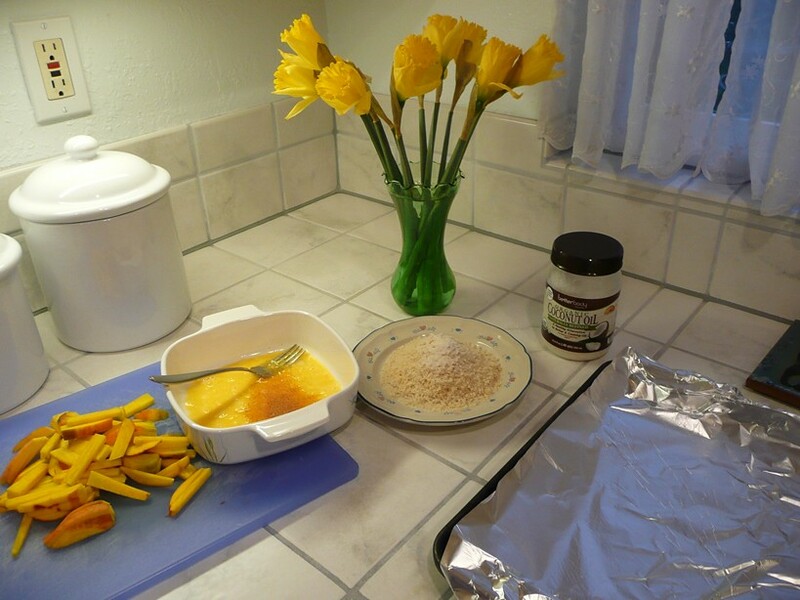 Cover the aluminum foil with the coconut oil. 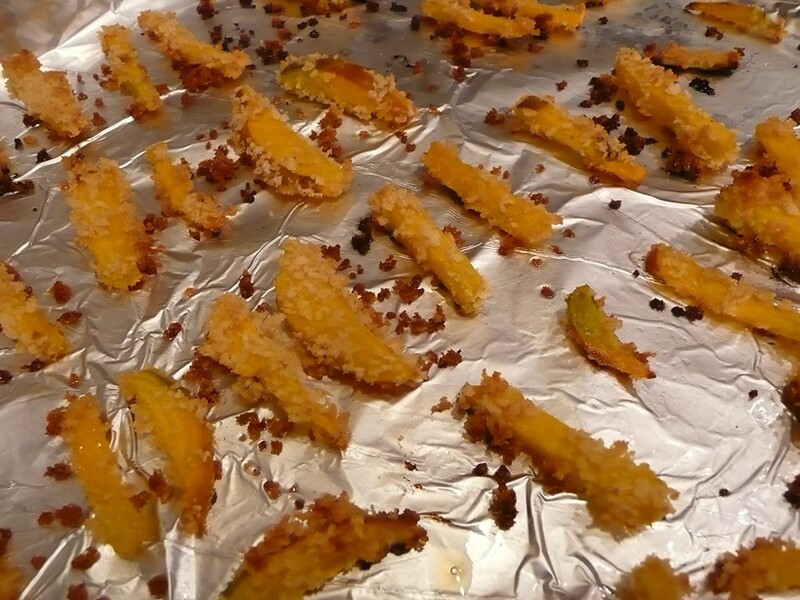 Preheat the oven to 450° F. Cut the beets up so that you have little french-fry shaped pieces. I put season salt in the egg. And garlic salt in the bread crumbs. Put the beets in the beaten egg. Then put the beets in the bread crumbs. Cover them as much as you can with the bread crumbs. Spread the beets out on the baking sheet. Give them a lot of room. Making just rows and rows of little breaded beets. Bake them for about 15 or 20 minutes at 450° F. Then turn the oven down to 300° F and bake for a few more minutes. Of course, that was my oven so you might want to check yours and bake accordingly. You want the crumbs to be golden brown. I was out of parchment paper so I used aluminum foil, but it might have actually turned out better. I think the foil might get hotter than the paper. It might help them cook. I used aluminum foil with my asparagus the other day and they turned out awesome. Anyway . 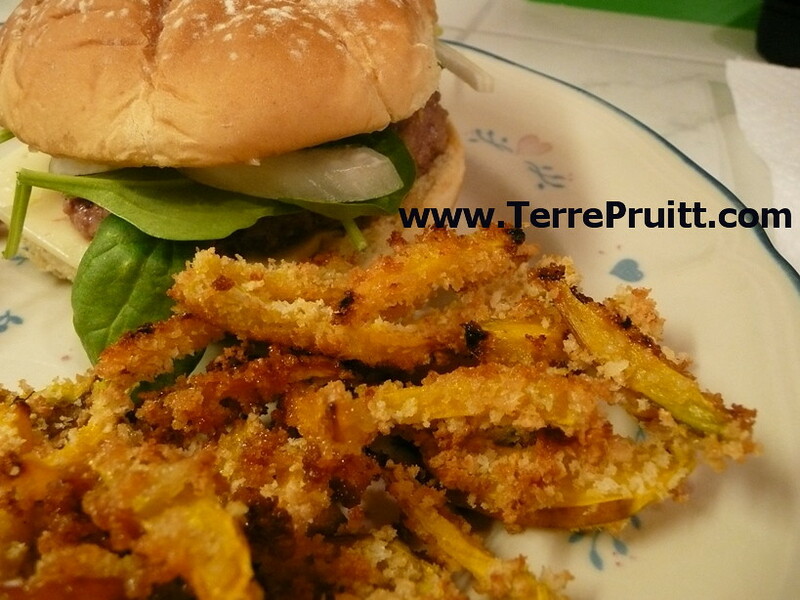 . . these were good, much better than the squash “fries”. Do you like beets? Do you like golden beets? Do you like fries with your hamburger? This entry was posted on March 16, 2016 at 9:57 pm	and is filed under "Recipes", Food. Tagged: baked beets, baked fries, baked vegetables, golden beets, grass-fed beef, hamburger and fried, yummy veggies. You can follow any responses to this entry through the RSS 2.0 feed. You can leave a response, or trackback from your own site. Yeah, beets kinda taste like dirt, so I can understand the boys not like dirt. 🙂 At least in a restaurant you don’t have to do all the scrubbing or peeling – depends on how you would normally prepare. And you don’t have to deal with all the dirt! Geez. So much dirt in my fridge from the beets!!! AHHHH. FLOUR THEN BREADCRUMBS. Yeah, that is kinda too much “extra” stuff on my veggies. 🙂 I think I vaguely remember seeing that and going, “Ooooooohhhhhhhhhh!” But then I forget because I am hesitant to even use bread crumbs. It is probably better that not a lot stick. But I shall try it one of these days . . . flour . . . .eggs . . . breadcrumbs . . . I am getting cauliflower in my box tomorrow and I bought US (you and me) some white sesame seeds and nigella seeds. When we get together I’ll give you some. Remind me! I am hoping to make the “cake” tomorrow. But I have to remember to NOT call it cake because then my hubby won’t eat it. He hates cake!